Iranian President Hassan Rouhani met Tuesday with the leader of the Palestinian Islamic Jihad terror group and urged Palestinians to “fight and resist” Israel until it capitulates. 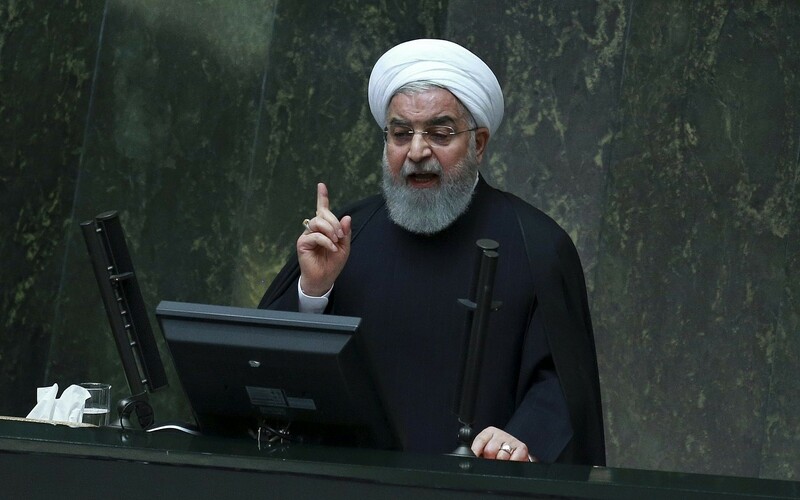 “The jihad of the Palestinians must continue until the Zionist enemy [surrenders] to the rights of the Palestinian nation,” Rouhani said, according to his office. Rouhani made the remarks as he met with Ziad al-Nakhala, who has been holding meetings in Tehran with top Iranian leaders. “Despite the Madrid and Oslo meetings and agreements, the Israelis have never accepted the rights of the Palestinians and therefore, the only way is to fight and resist,” Rouhani said, referring to a past peace conference and peace deals between Israel and the Palestinians, respectively. “The entire peoples of the region must consider the Zionist Regime not just the enemy of the Palestinian nation, but also the enemy of the entire region,” he added. “Despite all the efforts of the United States and the Zionist Regime, not only nations, but also governments have not surrendered to the greed of the enemies,” he said. Thanking Rouhani for Iran’s support, Nakhala alleged US efforts to promote Israeli-Palestinian peace were aimed at denying Palestinian rights. “Pressures and severe attacks of the United States and Israel against the Palestinians under the ‘Deal of the Century’ are aimed at closing the Palestinian case and we believe that US pressures on Iran is a part of this project,” he said, referring to US President Donald Trump’s peace plan. The latest comments by Rouhani, who is considered a relative moderate in Iranian politics, come after he called Israel a “cancerous tumor” in November. While Iran’s leaders frequently condemn Israel and predict its demise, Rouhani has largely refrained from employing such rhetoric in the past. Rouhani’s comments on the need to “fight and resist” Israel echoed those made Monday by Iran’s Supreme Leader Ayatollah Ali Khamenei during a meeting with Nakhala. “Palestine will strongly persist, and by the grace of God, the Palestinian nation’s ultimate victory will come true in the near future,” the ayatollah told Nakhala, who became PIJ’s leader in late September. Nakhala, who is based in Syria and is said to be close to Iran and its Lebanese proxy Hezbollah, told Khameini that the “people of Gaza are standing up to the Zionist Regime and the so-called Deal of the Century plot,” according to a readout from Khamenei’s office. “Today, the abilities and power of the Islamic resistance in Palestine is stronger than ever, hence if war breaks out, Tel Aviv and all other cities and settlements of the Zionist regime will be within the reach of thousands of missiles of the Resistance,” he threatened. Nakhala, who was born in Gaza in 1953, in September was named PIJ’s first new leader in 20 years. The group is considered a terrorist organization by the United States and the European Union, and the US labeled Nakhala himself a “global terrorist” in 2014. It opposes the peace agreements signed between Israel and the internationally recognized Palestinian leadership. This entry was posted on January 2, 2019 at 10:18 AM and is filed under Uncategorized. You can subscribe via RSS 2.0 feed to this post's comments. You can skip to the end and leave a response. Pinging is currently not allowed.